Clear braces are an innovation in orthodontic therapy that allows patients to enjoy straight teeth, without metal dental appliances. While there are many different styles of invisible braces, the most popular variety is clear orthodontic trays that are removable and customized to your smile. If you’re looking for ClearCorrect or Invisalign clear braces in San Antonio, North Star Family Smiles offers care to meet your needs. Contact our office today to learn more about your options for discreetly achieving a straight and balanced smile. Metal braces can treat these issues as well, but they are often considered excessive; patients with these common problems can also be treated with clear braces, which are highly discreet and offer enhanced comfort during treatment. Dr. El Bjeirami provides aligner trays that are made from transparent plastic and are also smooth, so they do not irritate soft tissue and are undetectable when worn. Your clear braces are also easy to use and keep clean. Simply rinse them with water to keep them clear of debris and remove them before you eat, drink, and brush your teeth as you usually would. 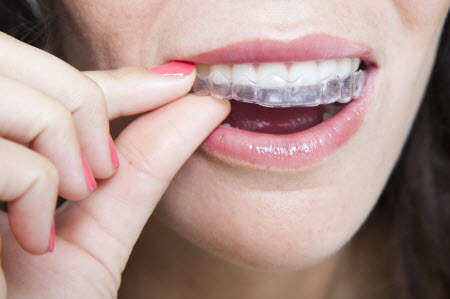 ClearCorrect and Invisalign are both brands of clear aligner therapy that work in the same method; patients are provided with a series of plastic aligners that are molded to the shape of their teeth. Each tray is worn for about two weeks before being swapped out for a new one. This process gently shifts teeth into ideal alignment. ClearCorrect and Invisalign braces are recommended to produce ideal results based on patients’ budget and goals. To begin your treatment plan, Dr. El Bjeirami evaluates your smile to determine if your current teeth alignment can be effectively corrected with clear braces. Patients who qualify for this treatment have impressions taken of their smiles so orthodontic aligners can be customized for each phase of teeth movement. Our patients love their new smiles with ClearCorrect Invisalign braces and are happy to report that no one can tell they’re wearing braces. Patients who start their treatment plans with us can take advantage of monthly specials to make their procedure affordable. Ask us about Clear Braces Today! Many patients finish their treatment plans in under a year. If your teeth are crowded, crooked, or your dental alignment has changed after a having braces in childhood, it may be time to consider tray-based orthodontics. Contact North Star Family Smiles today to learn more about ClearCorrect and Invisalign in San Antonio!